Skeletons are the animated bones of dead creatures given movement by magic. 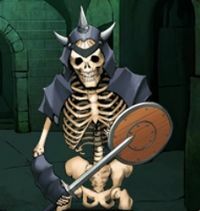 Though some may arise naturally in areas of great death, most Skeletons were created by Necromancers. 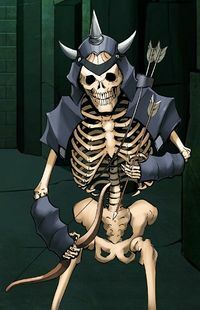 Skeletons tend to be mindless undead, acting only to slay the living, or to fulfill the will of whoever has the power to control them. Skeletons may be armed with weapons, showing some familiarity with both melee and missile weapons. This page was last modified on 21 March 2014, at 17:54.